Andrew Steiner’s career as a sculptor spans over forty years in Adelaide, covering a range of skills underpinned by an aesthetic and humane vision. He works mainly in wood, carving shapes that to Australian art historians are reminiscent of Melbourne based post-war migrant sculptors such as Inge King, and more precisely the biomorphic abstractions and constructivism of Julius Kane and Vincas Jomantas, respectively. Those artists, along with a few others like Clifford Last and Norma Redpath, are attributed with completely changing the focus of sculpture in modernist Australia. Steiner, too, was a post-war migrant. He came from Hungary, arriving here in 1948 as a child. He began sculpting in 1973, and his work has developed along the lines explored by the older Europeans interstate. Initially, it seems, his approach was mainly as a carver of objects, unlocking aesthetically pleasing forms in his chosen pieces of wood. Over the years he has become especially fond of the discarded limbs of Tasmanian Huon pine, although Australian Blackwood features prominently too, and he has developed his skills in bronze and metal and in works that rely on found objects. Steiner has received formal recognition for his work in the community, teaching about the Holocaust and trying his best to sew seeds in the minds of young people about the dangers of authoritarian impulses in politics and the inevitable inhuman outcomes of spreading hatred and division. He is a true multiculturalist and internationalist. He has exhibited internationally, in France and Hungary, and in 2006 and 2007 he took a solo exhibition of recent and retrospective works to the RSASA Gallery and Gallery M at Marion in Adelaide. He has undertaken numerous sculptural and leadlight commissions in his local community, as well as interstate and overseas, including his Remember The Holocaust I and II, memorials to the victims of the Holocaust for the Jewish Holocaust Museum in Melbourne and the Memorial Museum of Hungarian-Speaking Jewry in Safed, Israel. 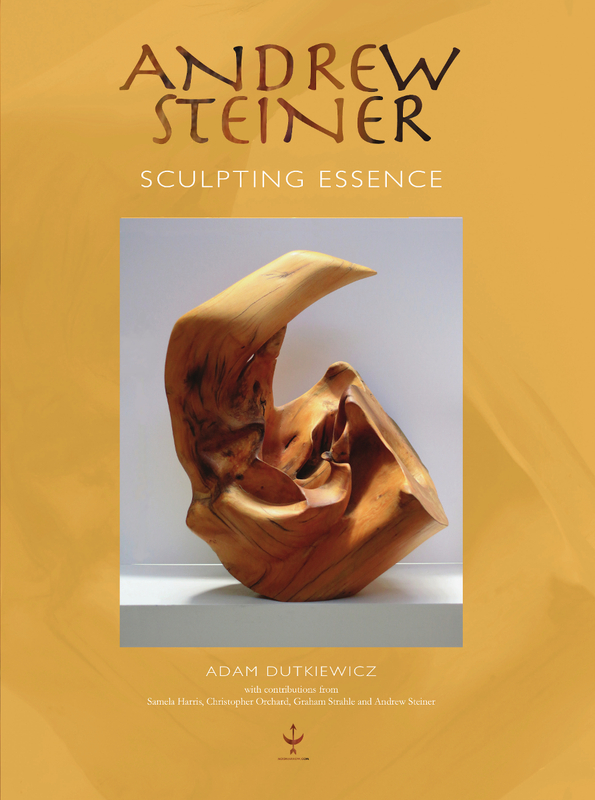 Andrew Steiner: Sculpting Essence was conceived by Andrew Steiner and Adam Dutkiewicz with help from Michal Dutkiewicz. It includes contributions from Professor Christopher Orchard and arts writers Samela Harris and Graham Strahle. The monograph is the ninth in the series Modern Art in South Australia. Cover image: Andrew Steiner, Sam, carved Tasmanian Huon pine, 80 x 60 x 40 cm. Royal SA Society of Arts collection, photograph by Adam Dutkiewicz.